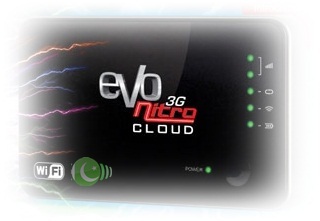 PTCL has introduced 3G EVO Nitro Cloud device, this is Pakistan’s first mobile Wi-Fi hotspot offering EVDO Rev B speeds up to 9.3 Mbps on the go driven by Pakistan’s fastest 3G EVO Wireless Broadband. Earlier I reported about the TENDA wi-fi router for PTCL 3G EVO and now this pocket-sized 3G EVO Nitro Cloud is an easy-to-manage portable 3G Wi-Fi router that creates a powerful Wi-Fi hotspot for its users virtually anywhere. EVO Nitro Cloud device allows users to share fast speeds of up to 9.3Mbps 3G Internet with multiple users and multiple Wi-Fi gadgets like iPad, netbooks, smart phones through a simple touch, all at the same time. Furthermore, it can also be used as a 3G EVO Nitro USB device. PTCL 3G EVO Nitro Cloud has a powerful battery that supports up to 10 hours of usage and standby time of up to 20 days gives its users the freedom to travel and connect anywhere anytime. It provides roaming at speeds of up to 9.3Mbps in 70+ 3G EVO Nitro covered cities with auto switch over to 3.1Mbps in 200+ EVO coverage areas. The introductory special bundle offer for 3G EVO Nitro Cloud is Rs.12,000 only; which includes absolutely free device with 4 months of unlimited data downloads. Monthly charges of Rs.3,000 only will be applicable from 5th month onward.